Djimon Gumbs shattered his own Shot Put National Youth Record, and had twin brother Diamante join him as the territory’s eight automatic homebased Carifta qualifier booking a ticket and ninth overall. 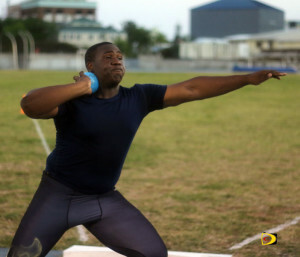 Djimon, fifth in last year’s Carifta Games U18 Boys Shot Put demolished the 16.44 mark the threw during last weekend’s National Jr. Championships, with a heave of 17.20m (56’5½”). Diamante eclipsed the Carifta standard of 15.75m with a personal best throw of 15.96m (52’4¼”). Djimon and Diamante will join twin sisters Tynelle and Trevia as Carifta Games participants becoming the territory’s second pair of twins to compete in the premier regional junior competition. Beyonce DeFreitas, fourth in the Carifta Games U18 Girls 200m last year, opened her season with 24.41 seconds into a -1.4 meters per second headwind in winning the event. DeFretias has also made the qualifying standard in the 100m after running 11.86 seconds earlier and 55.50 seconds last weekend in the 400m. Arianna Hayde, U18 Girls Javelin Throw, 39.08m. Akira Phillip, U20 Girls Javelin Throw, 39.00m. Deondre Mitcham, U18 Boys High Jump, 1.91m. (6 feet 3¼ inches). L’T’Sha Fahie, U20 Girls 100m, 11.74 seconds and Kala Penn, U20 Girls Triple Jump, 12.60m (41’4”). On the collegiate scene, Clemson Freshman Lakeisha “Mimi” Warner, won her 200m heat in 24.97 seconds and also her 400m heat in 55.75 seconds at the Charlotte 49er Classic. College of the Sequoias freshman Tarika “Tinker Bell” Moses, won a sprit double on her home track in the Sequoias Relays, with times of 11.31 seconds in the 100m and 23.56 seconds in the 200m. In Florida at the USF Bulls Invitational, Ronique Todman of ASA College, ran 48.57 seconds in his 400m heat to finish fifth and finished eight overall. He was coming off a personal best of 47.76 seconds in his previous outing. He rode a 3.4 meters per second wind to victory in the 200m, recording a time of 21.34 seconds. Teammate Kala Penn finished second in her 100m heat in 12.23 seconds, good for sixth overall. Penn who was coming off a personal best of 12.60m (41’4″) in the Triple Jump a week earlier, topped the table with a jump of 12.00m (39’4½”). Meanwhile, Kiwanna Emmanuel had a season’s best throw of 30.23m (99’2¼”) in the Discus Throw. At the 11th Spring Break Classic in Turabo, Puerto Rico, Albany freshman Jonel Lacey was sixth in the 400m with a time of 56.97 seconds. Tahesia Harrigan-Scott kicked off her outdoor campaign at the Miami Hurricanes Invitational with a second place finish in the 200m. She had a time of 23.73 seconds.